According to the 2007 Visitor Plant Inventory (“VPI”) report released today by the Department of Business, Economic Development and Tourism Research & Economic Analysis Division, the number of visitor accommodation units statewide in 2007 increased by 1.3 percent from 2006 to 73,220 total units. The increase was due in part to Internet research of visitor units that were not included in previous surveys. 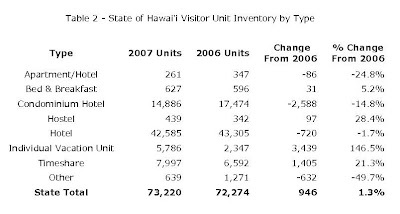 According to the report, 45.9 percent of the statewide visitor units in 2007 were located on O‘ahu. The island of Maui continued to have the second largest share of visitor units, followed by Big Island and Kaua‘i. The 73,220 visitor units statewide were composed of the following categories: hotels 58.2 percent; condominium hotels 20.3 percent; timeshare units 10.9 percent; individual vacation units (“IVU”) 7.9 percent; and bed & breakfasts, apartment hotels, and hostels each comprised less than 1 percent. The report defines IVUs as follows: “An individual condominium unit (not in a hotel rental operation), house, cabin, villa, or cottage with very limited service, often with only basic cleaning supplies provided.” Thus, transient vacation rentals and transient vacation units (together, “TVR”) would fall under this category. The report’s “List of Properties” includes both registered and unregistered TVRs. In 2007, there was a precipitous growth of TVR properties in the state: IVUs increased by 146.5 percent to 5,786 units, as shown in Table 2 below. As of 2007, the report found that each island had the following number of IVU properties : Oahu 69, Hawaii 127, Kauai 732, Maui 209, Molokai 15, and Lanai 1. Source: DBEDT Release News 08-13.